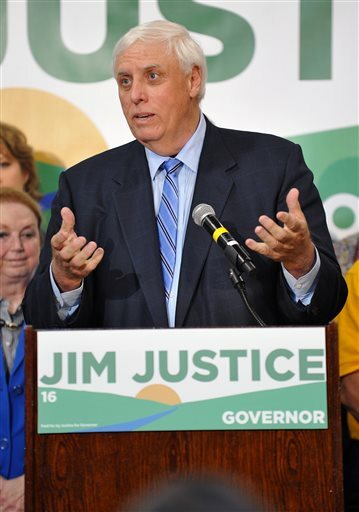 May 14, 2015 by Ken Ward Jr.
There’s a lot of commentary floating around about Monday’s big announcement that billionaire businessman Jim Justice is running for the Democratic nomination for governor of the great state of West Virginia. Some of it is fairly silly stuff. The Daily Mail for some reason thinks that having someone who can spend as much money as he wants enter the race is a good way to encourage other candidates to run in next year’s election. The Gazette wants readers to believe that Justice’s candidacy is proof that West Virginia’s Democratic party — which just lost both houses of the Legislature and another congressional seat — is “vital” and “dynamic.” Over at West Virginia MetroNews, Hoppy Kercheval is just glad that the Justice campaign will add to a “compelling game” that will provide plenty to talk about on the radio. NPR and Mine Safety and Health News reported in November that Justice had failed to pay close to $2 million in government mine safety penalties. The mines involved had an injury rate in the previous five years that was double the average rate for coal mines, according to the NPR/MSHN analysis. Sure, other and more local media outlets included mention of this. But Howard was the only one who made it the thrust of his coverage of the Justice announcement. Part of that is simply because tying it in to NPR’s remarkable series about unpaid safety fines (including a feature on Justice that was headlined Billionaire Spent Millions In Charity, But Avoided Mine Fines) was the hook for Howard covering the story in the first place. But perhaps this is also a case of an outsider seeing things more clearly and being willing to be a bit more honest than the rest of us. Such conclusions ignore the long line of Gazette reporter Dr. Paul Nyden’s stories about Justice’s Bluestone Coal being the coal producers who owed substantial sums to the state’s old workers’ compensation fund (see here, here and here). This kind of thinking also looks beyond the very real results of mine-safety violations, which we’ve written about before here and here. Perhaps the Justice gubernatorial campaign should be viewed, at least in part, through the context of the big coal news that happened the day after his announcement: the second Chapter 11 bankruptcy filing of Patriot Coal. Interestingly, just a few days before Patriot’s bankruptcy filing, the top story in Sunday’s Gazette-Mail was about the federal Office of Surface Mining Reclamation and Enforcement warning state officials that “the precarious financial situation that many of the state’s coal companies find themselves in today” could spell huge trouble for the Department of Environmental Protection’s abandoned mine cleanup program. Several citizen lawsuits brought by non-governmental organizations have also stressed the Debtors’ financial condition. The Debtors have incurred significant costs to comply with these laws and regulations. And then there’s what the Patriot bankruptcy means for United Mine Workers members, retirees and their families. 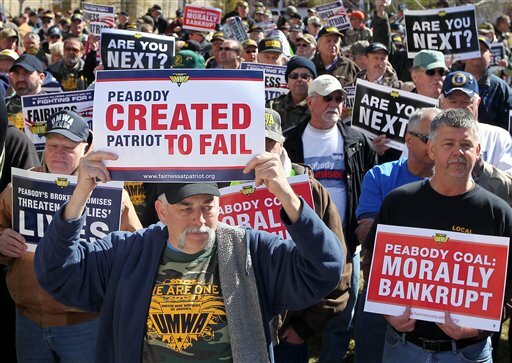 We’ve noted before that the last round in bankruptcy court wasn’t the end of the UMWA’s fight with Patriot (and Peabody and Arch) over what the companies like to call “legacy liabilities”, and we’ve explained how bankruptcy judges treat working people in these situations. In the 2012-13 Restructuring, the Debtors reduced wages and benefits for their non-union employees and retirees, negotiated new collective bargaining agreements with the UMWA, and transitioned their retiree healthcare obligations under preexisting collective bargaining agreements to a voluntary employees’ beneficiary association trust (the “UMWA VEBA”). However, substantial portions of the Debtors’ legacy liabilities remained in place. Notably, the Debtors’ obligations to contribute to the multi-employer pension fund under the UMWA 1974 Pension Plan (the “1974 Pension Plan”) and to make payments pursuant to certain federal statutes applicable to the coal industry (the Coal Act and the Black Lung Act, each of which is defined and discussed below) were unaffected by the previous chapter 11 cases. The Debtors’ capital structure upon emergence from the 2012-13 Restructuring remains in place today. Importantly, the aforementioned strategic party does not have employees represented by the UMWA or any union, and thus far has expressed an unwillingness to enter into a transaction that would involve assuming various legal liabilities related to, among other things, the Debtors’ collective bargaining agreements with the UMWA (the “CBAs”). The Debtors will explore all possible transactional solutions that do not involve having to reject the CBAs—and, most critically, these explorations will include active, direct, and comprehensive negotiations with the UMWA that seek a consensual outcome for all affected parties. If such consensual resolution is not achievable, however, the Debtors may not be able to avoid commencing, as they did during the 2012-13 Restructuring (and described below), proceedings under sections 1113 and 1114 of the Bankruptcy Code. What’s all this Patriot stuff got to do with Jim Justice and his run for governor? The history of West Virginia is, of course, largely defined by our relationship with the coal industry. We’ve quoted the great historian John Alexander Williams on this topic before on this blog. Part of that history is the basic fact that so much of the wealth generated in our state has been funneled mostly to the out-of-state owners of our natural resources. Another part of it is about the continual struggle to force the coal industry’s owners to internalize its costs, through fights over things like ending black lung disease, stopping mine disasters, reducing water and air pollution, protecting public health, and — now, confronting coal’s huge contribution to the climate crisis. As the much-predicted and inevitable decline of coal happens before our eyes, the legacy liabilities of coal loom larger than ever before. These are the issues that we and our leaders simply don’t want to confront and address. We’re running out of time. Justice announced his Democratic bid for governor Monday in White Sulphur Springs, W.Va., which is home to his best-known asset — the posh and historic Greenbrier Resort. Obviously, a lot of people view Justice as a true hero. It’s great that folks who played on the basketball team he coaches think so highly of him, and that some businesspeople think doing business with Justice through just a handshake is a good idea. When I was a little boy, West Virginia was at the bottom of every category coming or going. When my dad was a little boy, we were at the bottom. When his dad was a little boy, we were at the bottom. Something’s got to change. It’s not going to be easy. There are no magic potions. You tell me how and what in the world is wrong. Does Justice really not know what is wrong? Anybody who follows public policy at all in West Virginia knows many of the things that are wrong. Yet somehow, despite his desire to be our governor, Jim Justice seems unable (or unwilling) to identify any specific ideas or answers he has or positions he holds about how to fix our educational system, modernize our infrastructure, or cure our drug problem — let alone confront coal’s longstanding problems or to move forward in world where coal is clearly going to be a much smaller part of our economy. 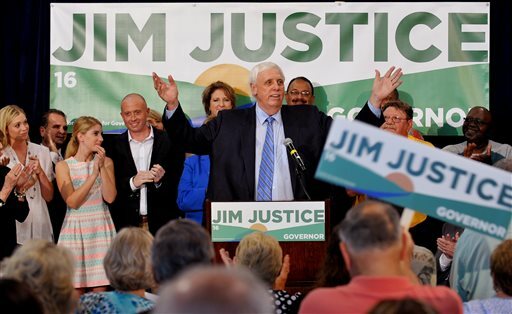 Perhaps most importantly, it seems impossible to imagine that a gubernatorial election that features Jim Justice as a candidate will involve the sort of real discussion about coal’s past and our future that West Virginians so desperately need. The candidates and the media aren’t up to the task of driving the debate that way. Just look at the Beckley paper’s follow-up story about the website the Republican party launched attacking Justice’s record on mine safety and environmental violations and fines — as if GOP candidates in West Virginia really favor strong enforcement that protects workers and curbs pollution. At this rate, we’re going to end up with another election that features nonsensical advertising campaigns over which candidate is more pro-coal and more anti-EPA. If the career campaign consultants have their way, every 2016 race in West Virginia will again be about President Obama, who won’t be on the ballot. Sure, Jim Justice loves West Virginia. But it takes more than love to turn a troubled state like ours around. What fixes have our current elected leaders applied? Since WV has been at or near the bottom in most major categories for the last 80 years – what would it hurt for Justice to become governor? The worst is we drop from 48 to 50 – don’t think that’s going to impact the day to day living of most people.